Move over, Duffs. Step aside, Anchor Bar. 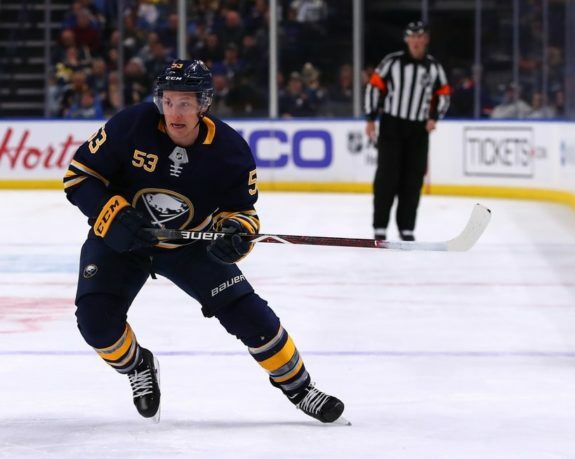 The hottest things in Buffalo aren’t wings; it’s the Sabres’ top line consisting of Jeff Skinner, Jack Eichel and Jason Pominville. Together, they’ve put up 35 points since facing off against the Los Angeles Kings on Oct. 20. In the seven-game stretch, the trio has clicked at the 1980s Edmonton Oilers heyday pace. Skinner (eight goals and five assists) and Pominville (seven goals, six assists) both have 13 points, while Eichel (one goal, 11 assists) has 12 points. It’s been years since the Sabres have had a line clicking on all cylinders like this. They’re on fire, dominating the ice and making things happen almost every shift. In Saturday’s matinee matchup against the Ottawa Senators, a 9-2 shellacking, each member of the three musketeers had a three-point game. Pominville and Skinner tallied two goals apiece while Eichel collected three apples. The Sabres goals came in bunches, filling the net behind netminders Craig Anderson and Mike McKenna like a kid’s trick-or-treat bag on Halloween. The KeyBank Center crowd of 17,881 was the second-largest of the season and was delirious. They cheered the team off the ice after each period and often erupted into a “one, two, three, four, five, six, seven, eight, nine, want 10!” chant. It was the Sabres’ most lopsided win since Jan. 27, 2009 when they defeated the Edmonton Oilers by a score of 10-2. The last time the team erupted for nine goals at home was over a decade ago­–a 10-1 drubbing of the Atlanta Thrashers on Jan. 18, 2008. 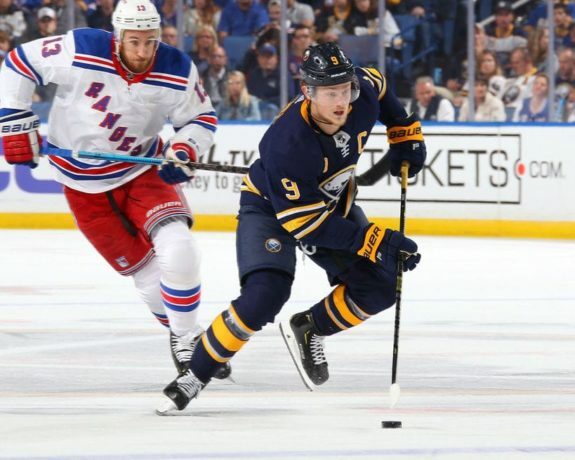 Eichel, playing in the first year of his new contract, has six goals in the last five games, and seven assists in the last four games. Eichel, now with four goals and 13 assists on the season, has 17 points in 14 games. The face of the franchise is on pace for a 99-point season. He has points in each of his last four road games (eight assists) and enters the game against the New York Rangers on a four-game point streak (one goal, seven assists). Skinner has nine points in his last five games, including four goals–two at even strength and two on the power play. The 15 points he’s collected in the last 10-games is the most productive stretch of his career. He also has a plus-12 rating, sharing the league lead with Filip Forsberg of the Nashville Predators. The Toronto, Ontario native will be an unrestricted free agent after the season and is making the most of his time with new team. He’s also making a hefty case for cashing in on his next contract. Every day that goes by and every game that he’s on the scoresheet increases his leverage for his next deal. At 5-foot-11, 187 pounds, Skinner is using his speed, craftiness and ability to put himself in the right places on the ice make him a real threat. It’s similar to how Danny Briere was played. He just flat-out knows how to score. Through 593 games, he has 213 goals and 182 assists for 395 points. The ever-popular, fan favorite Pominville appears to be skating on a fountain of youth. The 35-year-old right winger is on his longest point streak since 2014, collecting points in seven straight games. While he was honored by the franchise for skating in his 1,000th game on Thursday by the Senators, Pegula and company held a celebratory pre-game event for him before puck drop. Fans held “Welcome to Pominville” signs, a tribute video filled with highlights and congratulatory messages from former teammates and coaches played, and his parents and family were on hand to experience it all. It was all too storybook as Pominville went on to score two goals and was honored as the game’s first star. “Thank God we had the lead and I could look up and enjoy it a little bit more,” said Pominville graciously. “I wanted to make sure I enjoyed the moment and took the time to hear what everyone had to say, and I think for the most part I did. I’m sure I’ll have a chance to probably hear a bunch of the messages again.